St. Mark's Episcopal Church, once located here, was organized as a mission parish in 1846. Originally a simple rectangular frame building with twin front doors. The church was altered and enlarged over the years and was moved from its original beachfront location in 1925 to face 16th Street. 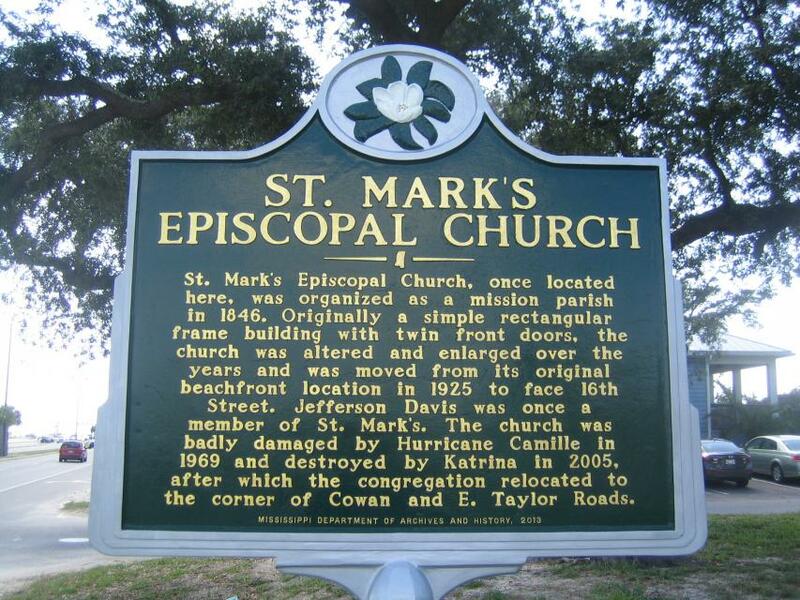 Jefferson Davis was once a member of St. Mark's. The church was badly damaged by Hurricane Camille in 1969 and destroyed by Katrina in 2005, after which the congregation relocated to the corner of Cowan and E. Taylor Roads. This marker can also be identified by its HM code. You can use the hashtag #HM1JA5 in tweets, and any other place where you might refer to this marker, including when searching on this site.